I think I will make some pancakes this morning. I don't think my pancakes will be served in a pretty tray like yours. 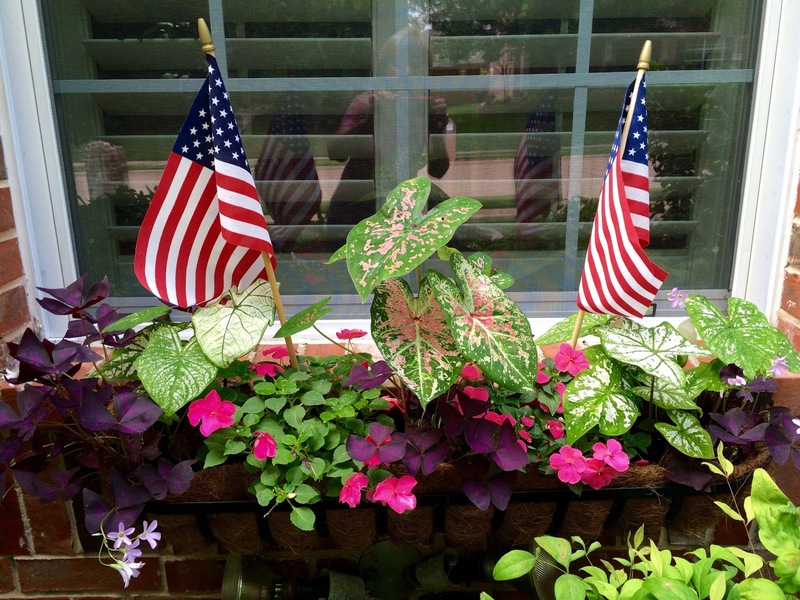 Your window vignette is perfect for Memorial day. p.s. your flower is beautiful...such a pretty color! 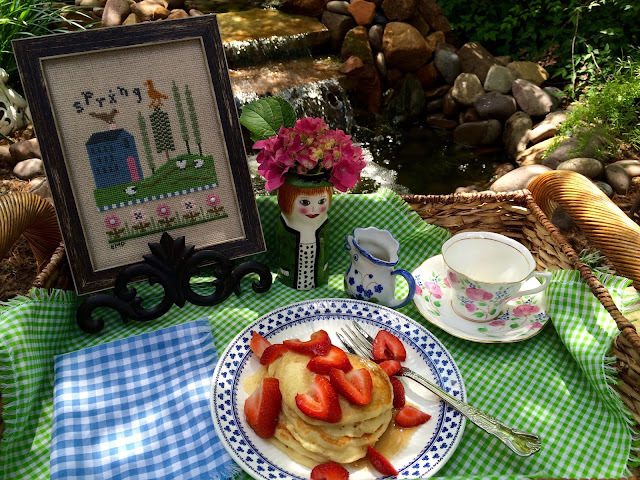 It doesn't get any better than pancakes and strawberries by a waterfall! I'm glad the hydrangeas are doing well for you this year. Your window box is very festive for the holiday weekend. Happy Memorial Day! I think of BJ as the queen of desserts! My goodness but she makes everything look, and sound decadent in her posts. I'll have to peruse this recipe, I use buttermilk in my pancakes but maybe there's something special I can do for the fluffiness. I'm glad your hydrangea is finally putting on a show but they do want to take a year or two to establish below ground before thrilling us with a show of flowers. The pancakes do look yummy. I love Bj's blog. Now I'll have to try them. Such a pretty setting , especially with that pretty bloom. Enjoy your Memorial Day, Kitty! Those pancakes sound so good, Kitty. I love a stack of pancakes drizzled with pure maple syrup! I like your window box; very pretty! Happy Memorial Day, my friend! They look fabulous, Kitty! BJ is the pancake queen. Nice tribute to her and Sweet Nothings! Love your window box planter. Kitty, I agree, bj always has something good cooking up in her kitchen. Your pancakes look so good I know I will have to try them, I hope I will make bj proud too. Lovely teacup on such a pretty tray, love the gingham. I only had a couple of blooms on my hydrangea and it's not doing anything this year. I think I will have to plant new ones. Happy Memorial Day to you………. What a pretty teacup and those fluffy pancakes are making me salivate! I'm also admiring your hydrangea. Last weekend, I transferred a potted hydrangea into my garden...and sadly, it didn't survive. The setting is so pretty! Love yur pretty teacup and so glad your Hydrangea is performing better...I just love them! The pancakes look wonderful! Sometimes ya gotta have'em! Thanks so much for linking to Tuesday Cuppa Tea! Hello Kitty, you made the vignette outside so pretty. I love your pink hydrangea and the pancakes look and sound so good. What delicious pancakes and I do so love Rosina cups and saucers - always favorites as I have quite a few. I am going to go copy her recipe and I think her blog and face book site as darling! Thanks for sharing and linking. Looks delish! I do love that tea cup and saucer...so delicate. All of your flowers look beautiful! Hopefully, all this rain will help them stay longer. I always hate when the intense heat begins to burn everything. Hope you've had a relaxing weekend! I sure hope you had an enjoyable weekend. We did, in between rain showers! I do feel like I may have webbed feet soon, though. Such pretty pancakes and the Rosina Teacup is so precious. Our blog Retreat is almost here-I will email out directions today and if you have extra scissors please bring those with you! Kitty, what a sweet post!!! I'm really thinking I need some pancakes now!! Love your teacup, it's pure delight! Sweet Kitty, I will have to try the Fluffy Pancakes. Yours look absolutely delicious! I am so happy to hear that you have an abundance of blossoms this year! Kitty, you are so good about trying new recipes & I'm glad that you share your results with us. 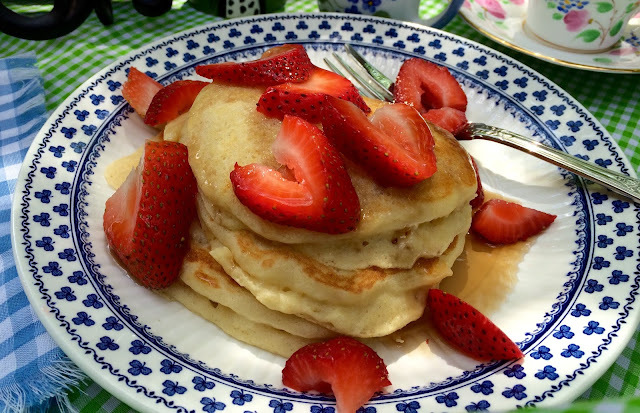 I saw BJ's post & drooled...love that you served yours with fresh strawberries! You have a lovely teacup, too. 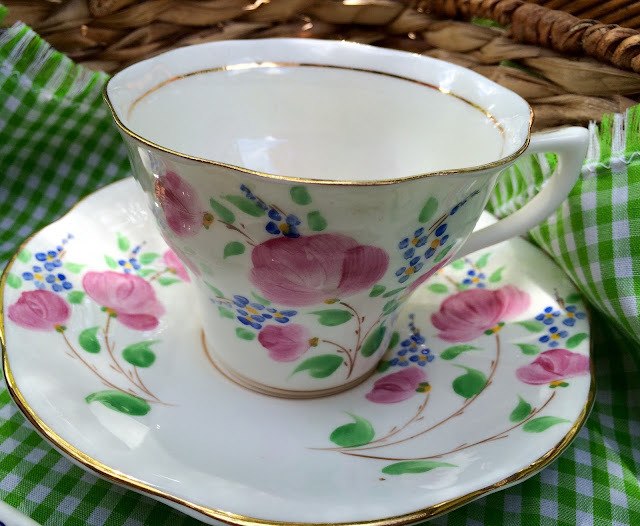 Did I tell you I am planning a "Teacup Exchange" for my quilt guild's summer picnic? Your posts have inspired me! Mmm . . . love pancakes! Those look delicious. I don't really know bj, but have visited her blog a few times, and she seems like so much fun! I have had the biggest craving for pancakes lately Kitty, and haven't ever made them with buttermilk. I can't wait to try her recipe, especially covered with summer strawberries! So happy to see you here at TOHOT on this dreadfully gloomy day-we need sunshine! Kitty, I will definitely check out those pancakes. Funny, I was just thinking about BJ the other day but couldn't find her website. Love that cup and saucer! I love BJ and I am going to get this recipe for my grandsons. So happy to see you at TOHOT Kitty. Your hanging basket is gorgeous and the pancakes look mouthwatering and with my favorite strawberries. Jean does breakfast well doesn't she? I want to try her recipe too. I printed it out and will soon. Thanks so much for linking to "Tea In The Garden". Looks like you are the only linker so far but I'm OK with that. I just love doing it! Thanks for participating. Love BJ's blog and found yours via Bernideen's Tea Party. After your sweet endrosement I will be making those pancakes for sure. Love your setting. I agree that BJ has the best pancakes ever and you have the best tea table ever! Looks like we may begin to dry out next week, at last!! Thanks so much for sharing with Full Plate Thursday and have a great weekend! Have a beautiful Sunday, lovely friend. Hugs, joy, and blessings to you! Oh my Kitty, they do look delicious! I agree that bj is the Susan Branch of TX. :) Can't wait to try them! Your vignette is so sweet. Thanks for sharing with SYC. Those pancakes look delicious - I love your analogy between BJ and Susan - so true!! your lady vase is very sweet, especially with a "hydrangea hat"!! Hi Dear Kitty~ this post came up just as we were on the road headed for Canada and soon to cross the border which ment no more internet. I knew I would be coming home and trying this recipe, and that I did for our dinner this evening. I must say, my husband and I were not disappointed. I use a recipe out of my Red Rose flour cook book from Canada that is awesome, but this one will take precedence over my recipe.